Kitchen Lighting – Is your kitchen bright enough? Is your kitchen bright enough? This is my kitchen. It’s a tiny little kitchen, but I still have a ceiling light over the sink, light and vent from microwave over stove, undercabinet lighting in the corner, so I can measure coffee in the morning, a lighted ceiling fan, light from the window and the sky light and the three pendants over the bar. Posted on January 19, 2015, and tagged ambient lighting, downlight, general lighting, kitchen lighting, lighting plan, mini chandelier, monorail, pendants, recessed lighting, sconce, skylight, task, track lighting. 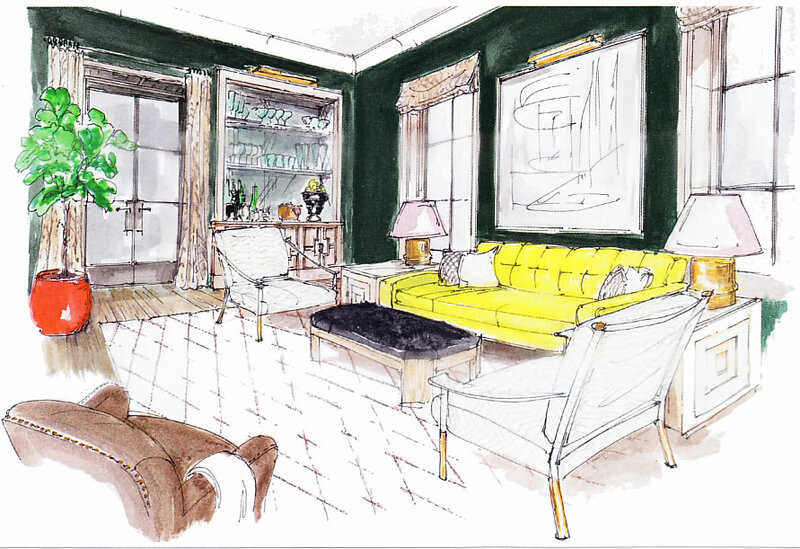 “For the San Francisco designer, a multipurpose room doesn’t always have to be TV-centric. 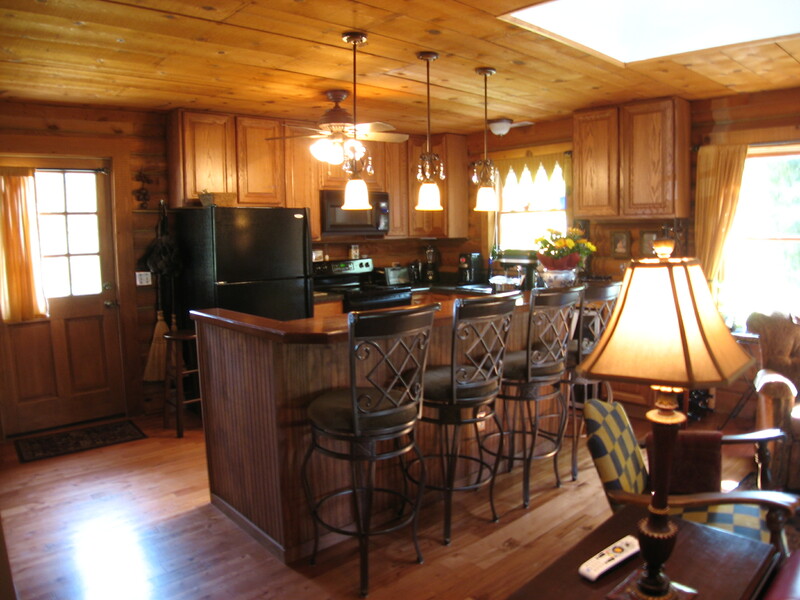 It can be a tranquil retreat or a great place to entertain. Posted on March 15, 2014, and tagged art, artwork, display, pictures, planning, room design. I just love these small recessed lighting fixtures! They work in so many areas and they are easy to install on suspended or finished ceilings. WAC Lighting’s Beauty Spots Recessed Lighting Crystal Pyramid DR-G361-CL used alone creates beautiful patterns. Posted on September 4, 2013, and tagged ambient lighting, decorative, decorative lighting, recessed, recessed lighting, WAC. 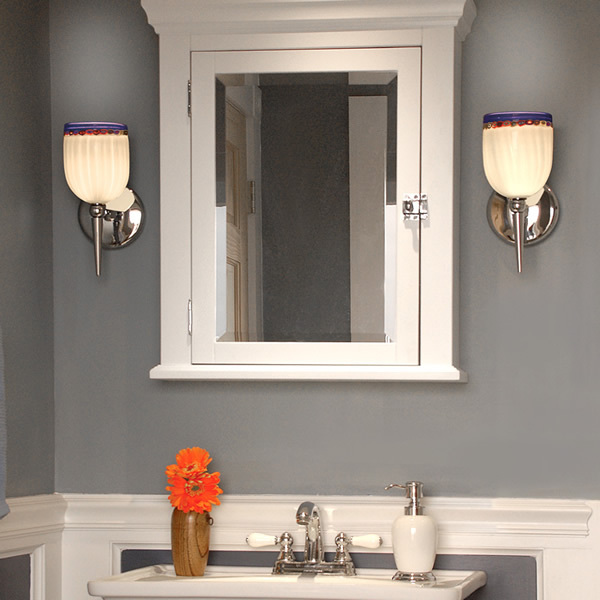 The Rosetta Wall Sconce from WAC Lighting’s European Collection on either side of a mirrored medicine cabinet. Bella figura, Rosetta offers fine Italian styles that combines a classic profile with multiple murine glass patterns that will enhance any setting with a perfect mix of form and function. Posted on February 18, 2013, and tagged ambient lighting, decorating, decorative, decorative lighting, downlight, energy efficient, recessed lighting, WAC. 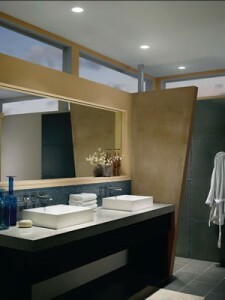 There is a wide variety of shower trims available for recessed lighting. Shower trims include a lens and are rated for wet locations. 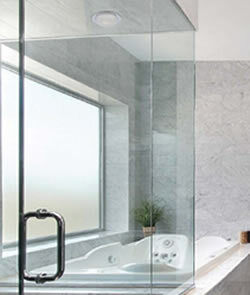 Shower Recessed lighting is available in a variety of sizes, from 2″ to 6″. It is available for standard base bulbs, fluorescent, GU10, MR16, Xenon and LED. Your shower needs enough lighting for safety and grooming. 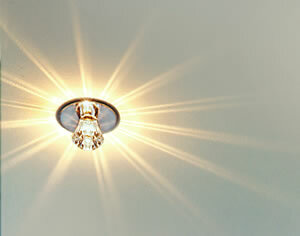 Recessed lighting can add additional lighting to the shower area of your bath safely, without adding a bulky fixture. Posted on November 11, 2012, and tagged fluorescent, GU10, LED, lighting, MR16, recessed, shower, standard base bulbs, trims, Xenon. 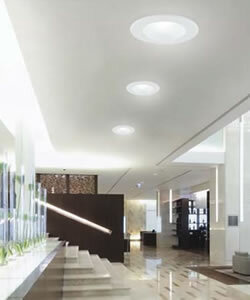 Convert your existing recessed lighting to super energy efficient LED with a new easy-to-use kit from Eurofase. The kit includes everything you need to convert a typical 6 inch recessed can that uses a 150W Incandescent R40 to PAR 38 bulb. The LED driver is powered by screwing into the bulb socket. The 14W LED SHARP 120V/277V LED is provided. The LED Kelvin 3500K emits a warm white light. Posted on November 8, 2012, and tagged ambient lighting, artwork, can, decorating, downlight, energy efficient, Eurofase, general lighting, interior design, LED, light, lighting, paintings, picture light, recessed, Recessed Conversion Kit, recessed lighting, UV. Posted on November 8, 2012, and tagged can, decorating, decorative, general lighting, LED, light, lighting, planning, puck, recessed, recessed lighting, WAC.